Post includes FVDI 2018 free download mega link, frequently-asked-questions and feedback on what can work and don’t work. it works as crappy as FVDI 2015, just adds some VVDI2 functions. Lots of functions of the newer softwareversions dont’work properly but it still can be worth the money depending on which (working) functions you need…. A: “flyfvdi” does not have the device “FVDI 2018” while “flyobd” has. flyobd (STIC technology co., LTD) is the original factory of FVDI 2018 unlock version. Q: Where to buy FVDI 2018? Who is right and who is fake? Now it is no longer clear. Sympton: error 2737 EWS anti-tampering. Result: OK, done quickly, first car cranks only then stop, 2nd start car fires up! Key learning: select Opel / Astra H > Connect immo > read fine, insert new key, Select next empty position, then Program transponder and remote and write pin. Procedure ask ignition off, than ignition on, done. Car fires up with new key, after remote also work! Getting the SKC -> Simple job, Key learning -> Ignition ON -> Auto detect. Some minutes later PIN appear. to learn new key, need to prepare a VIRGIN Megamos ID48 transponder after Auto detect the pin. After PIN appears, also appear a button : Prepare Dealer key. Need prepare the transponder with this function, actually read details from immobilizer to prepare the transponder for the car, and also send the Dash to BOOT mode with virginized key slots. So now got prepared transponder, and dash in boot mode -> I used wizzard mode of key learning. Function detect the vehicle, then automaticaly select the proper lines, just need click Next button. Next menu, ask the number of keys. Simple set the number of avaliable keys. The program follows the whole learning procedure, well commented with message boxes, ask step-by-step key->igniton->nextkey->ignition. During whole procedure, dash should show L7 x-y. L7 means immo status 7 -> key programming, x means actual key number, y means total number of keys. After all keys programmed, should see L0 x-x where x the number of keys. This state is almost the same as at the begining, car wont start. I mentioned L0 means immo status. Need to put it to adapted mode. Choose Instument K-Line -> since this car had R8 crypto+ dask, choose this type at the top rolldown list. Press Read button. 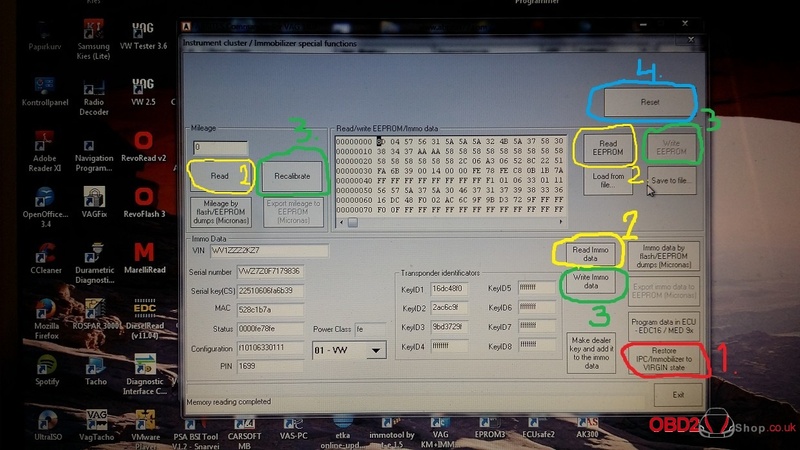 After read it shows the eeprom content, km, skc, and immo status also! At immo status this time is 0. This value need to set 6 then press “Change”. After done dash restart and km appears again. Finally: Keys programmed, working well, starts the car. Used to program remotes with the Remote programming special function. Was simple, set remote memory positon, press learn, program ask press LOCK button, after press LOCK automatically sotred, working fine. This time need to report a bug, hope could fix it in the future. Since the car had CAS3 this was a brand new experience for me. Sadly not tried to read out by OBD, but R270 solved the READ/WRITE procedure since the board was not look like the same as in the BDM software’s picture help… but the only diff was not so much, only 2 pins (coaxial to timing crystal) needed to solder as the same as CAS2, not as the picture, but that is an other thread…. So dump successfully read. After load dump to FVDI Key Tool, everything look fine, select new key slot to prepare, prepare done, but after saving the write back dump, it was an empty 4k bin file, so there must be something wrong with Key Tool software since 3/3 time after prepare the saved dump is only contains full of zeroes in a 4k bin file. Since know this is not a working dump, tried to find another way. So lucky had an own developed CAS editor, so modified the dump with that, but after write back key did not start the car, so on, the car said it is an unknown key. After that was clear, the FVDI key tool’s bug maybe at key preparing for CAS3, and looks like key preparation is also failed. Did not want to remove CAS again, so renewed the key with VVDI Key Tool, and after that again prepared with FVDI Key Tool software but this time choosed CAS2 (should use new virgin key, or renew the badly locked one). Loaded dump like CAS2, prepared key. Since CAS already contains the key id, and with CAS2 option the FVDI prepare well the key, this time everything worked fine, but would be nice to fix this! Remove CAS3 option, and edit CAS2 line to CAS2/3 or fix the CAS3 key prep fail and dump preparaion fail. – Remote not working, but it is probably key’s fault. CAS reading : Could not do via OBD port -> Error message talks about security issue. Read CAS via BDM (R270), after got dump used FVDI TAG and Keytool to prepare new key. Write back modified dump to CAS via BDM, after everything was fine. Car starts, remote works fine. the FVDI don’t kill BSI, the USER who start a diagnostic session without a battery charger kills the BSI. Notice 1: What FVDI Benz Can’t Do? Don’t do Key Sync for Benz Smart 450 and 451. Don’t use FVDI to change mileage for BENZ W212! FVDI can’t do it, it will reprogram the CGW ( ZGW ) unit automatically, then damage your car. Don’t use FVDI to change mileage for BENZ Sprinter 906! it possible damge your car dashboard. 16. Mercedes Benz W164 2009 changed the mileage to new one but then it rolled back to old. After three attempts, it damaged the rear SAM of the car. Damages: Needed to replace Rear SAM. 17. Mercedes Benz w204 2008, which does not change the mileage and does not read EZS at all. After few tries did change the mileage and blocked EZS but lost communication via obd2 and damaged ZGW. Notice 3: What FVDI Opel can’t do? 1) cannot read/write eprom of OPEL Delco z14xe engine ECU. 2) cannot read/write Astra H airbag ecu and can’t fix crashdata. 3) Cannot do Mileage Correction for Corsa D via OBD. Corsa D is 35080. Not possible by OBD. best way is to remove eeprom read it erase and program with new values. Notice 4: What FVDI PSA can’t do? Whatever we suggest you not to try FVDI on Johnson BSI, from time to time, we hear people damage this ECU by FVDI, better for you to use another more safe tool for this Johnson BSI. Some FVDI PSA users warn others: FVDI kills Johnson control BSI. Exactly, BSI is not kill,it is in boot mode but car is in economy mode, put BSI in car but star other car and connect +and- in car for read BSI is work 100%. To explain better my procedure: no problem when you read BSI connected other car will start on the battery of the vehicle you read BSI because the proceed is not fast and your vehicle goes into economy mod then your BSI remains in boot mod and does not want to start your car if you happen redone a reading of your BSI and finally exit the boot mod reading and more concern, especially connect another car started on the battery of the vehicle to read. You could understand like this: the BSI goes in economy/boot mode because the procedure takes much time – I have to connect another car to the battery of the non-starting car, start the donor-car and then I will be able to connect to the “dead” BSI and revive it by switching off the economy/boot mode. 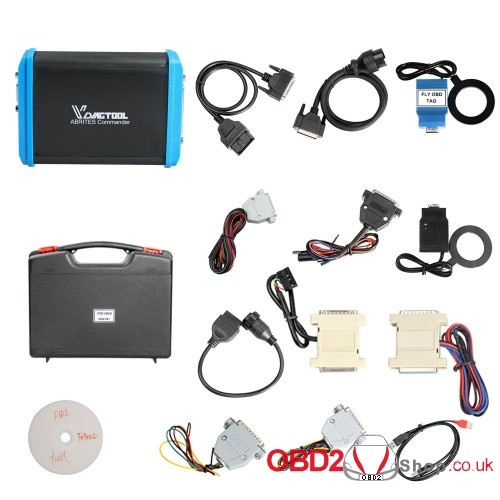 1) FVDI ABRITES Commander for Peugeot Citroen(V5.1)SV64,it can’t read BSI immobilizer code. (Some peole may say FVDI can read BSI Johnson, but we suggest you not to try it, more safe). – Feature in relation: Mileage Correction, Dash with big LCD screen. Problem is diagnose modules on VAN network on same car:srs,uec,rec,instrument cluster.Not see modules. – Result: Can’t connect, other systems find. – Feature in relation: Read Pin engine ecu & works. – Feature in relation: Change Instrument Cluster, Component Protection by OBD and KM change & works. Because not all gateways are supported by OBD. Vw jetta 2008. Destroyed 2 id48 can megamod transponder *wrong security bite writed to transponder. can’t make dealer key for learn. Tryed on all given options but can’t read. – Result: Cluster show – – – – – – but after correct ezs with Datasmart3+ and sync ezs – cluster with FVDI, OK.
– key programming after all key lost OBD: OK !! – Feature in relation: Change cluster with Micronas. 2: Put back original cluster to car and ignition on, read Immo Data, eeprom and read mileage. Don’t turn off ignition. 4: Now you can reset cluster and the magic have happend. I programmed a new card. As far as >I know the problem comes from Renault vehicles from 2012 on. I mean Bcms updated, I´ve got Tcode premium I am able to program cards only until mid 2012.
for key programming on Renault newer cars, megane 3 or newer, only original AVDI has solution via OBD only. also keep in mind that Duster ph2, clio 4 , and newer use hitag3 chip, CAN-tag-reader, etc. PIN/APV is 32 character (vs 12ch old one). – Feature in relation: Odo corection. When you adjust mileage on Peugeot/Citroen, it is best to put BSI out from eco-mode with Diagbox, take out fuse for front wiper and turn parking light on, put charger to battery. It is safe now to adjust mileage with FVDI. They let me know that a donor cluster was used to actually do mile calibration because original not able to do. I find out thats because of chip in EIS was motorola and needed to be done separate and not use can block software on this. you need to turn igninion for 1 sec ON than turn OFF.